Season Three (Book Three: Fire) of Avatar: The Last Airbender, an American animated television series on Nickelodeon, first aired its 21 episodes from September 21, 2007 to July 19, 2008. The season was created by Michael Dante DiMartino and Bryan Konietzko, and starred Zach Tyler Eisen, Mae Whitman, Jack DeSena, Jessie Flower, Dante Basco, Dee Bradley Baker, Greg Baldwin, Grey DeLisle and Mark Hamill as the main character voices. This third and final season focuses on Aang's quest to defeat the tyrannical Fire Lord Ozai and finally restore harmony and order to the world. The season is then followed by The Promise, The Search, and The Rift comic series that take place one or two years later after the hundred-year war's end. The final season features twenty-one episodes, one more than the previous two seasons. The season finale consisted of the four episodes airing together as a two-hour television movie. Season Three received a similar positive critical reception to that of the previous seasons. The season, and especially the four-part finale "Sozin's Comet", received much critical acclaim, with praises from sources such as DVD Talk. Between October 30, 2007 and September 16, 2008, Nickelodeon released four DVD volumes and a "Complete Box Set". The season was produced by and aired on Nickelodeon, which is owned by Viacom. The season's executive producers and co-creators were Michael Dante DiMartino and Bryan Konietzko, who worked alongside episode director and co-producer Aaron Ehasz. Most of the individual episodes were directed by Ethan Spaulding, Lauren MacMullan and Giancarlo Volpe. Episodes were written by a team of writers, which consisted of Aaron Ehasz, Elizabeth Welch Ehasz, Tim Hedrick, and John O'Bryan, along with creators DiMartino and Konietzko. The season's music was composed by "The Track Team", which consists of Jeremy Zuckerman and Benjamin Wynn, who were known to the show's creators because Zuckerman was Konietzko's roommate. In the season's beginning, protagonist Aang and his friends Sokka, Katara, and Toph are traveling through the Fire Nation, conjuring a plan for invading the Fire Nation and looking for a teacher to teach Aang Firebending. Midway through the season, Aang gathers friends he met in previous episodes and leads a failed invasion into the Fire Nation. Former antagonist and anti-hero Zuko changes sides and joins Aang, serving as his Firebending teacher until the four-part series finale when Aang finally defeats the Fire Lord and ends the one hundred-year war in a surprising way: he uses a new ability to permanently rid Ozai of his natural firebending abilities to avoid violating selfless Air Nomad teachings. All of the central characters generally remained the same: Zach Tyler Eisen voices Aang, Mae Whitman voices Katara, Jack DeSena voices Sokka, Jessie Flower voices Toph, Dante Basco voices Zuko, Dee Bradley Baker voices Appa and Momo, and Grey DeLisle voices Azula. Additionally, Mark Hamill joins the cast to voice Fire Lord Ozai after having minor appearances throughout the first and second seasons of the series, while Greg Baldwin now voices Iroh due to Mako Iwamatsu's passing. Henrik Batallones, a BuddyTV Staff Columnist, also noted the wide variety of positive reviews from the press for the series finale, noting that sources such as The New York Times and Toon Zone gave Avatar: The Last Airbender "glowing reviews". The season also received praise for its video and sound quality. Nick Lyons from DVD Talk felt that the video quality appeared better than previous seasons, which had also garnered additional awards. He also remarks that the sound is "spot on...as per usual." At the 2008 Annie Awards, the season won "Best Animated Television Production for Children". At the same Annie Awards, Joaquim Dos Santos won the "Best Directing in an Animated Television Production" caption for his directing in "Into the Inferno". Joaquim Dos Santos also gave Avatar: The Last Airbender a nomination at Annecy 2008 for his work with "The Day of Black Sun Part 2: The Eclipse". Additionally, music editor and composer Jeremy Zuckerman and the sound editing team were nominated a Golden Reel award for "Best Sound Editing in a Television Animation" for their work in "Avatar Aang". Aang awakens to find himself weakened, his head full of hair, and all of his friends dressed in Fire Nation clothing as they travel on a stolen ship. He is dismayed to discover that the world believes him to be dead, just like when he was frozen in ice. Sokka believes that this is a positive development and insists they should maintain the illusion as long as possible, since it means the Fire Nation won't be hunting Team Avatar anymore and that they won't be expecting Aang at the invasion. Zuko and Azula are welcomed home as heroes, and Fire Lord Ozai makes his first appearance in the series in which his full, unobscured figure is revealed, as he congratulates Zuko for killing the Avatar. Zuko realizes that Azula credited him with the honor-bestowing reputation for having killed the Avatar for ulterior motives that will eventually serve her own ends. Aang tries to run away by himself, but his friends find him. He accepts that with the fall of Ba Sing Se, secrecy is their greatest advantage, and gives up his glider, a part of his identity as an airbender, to the lava flows of Avatar Roku's island. Aang and friends steal some clothes as temporary disguises while traveling in the Fire Nation, and Aang is accidentally taken to a Fire Nation school. He hides his tattoos with a headband and long sleeves, and learns the Fire Nation pledge of loyalty and must maintain his cool upon hearing propaganda about the death of the airbenders. He organizes a school-wide dance party for the up-tight Fire Nation kids. When the principal arrives to shut it down, the kids help Aang escape. A form of movement similar to Capoeira is shown as a Fire Nation traditional dance. Meanwhile, Zuko becomes increasingly certain the Avatar is still alive and hires an assassin to kill Aang. The gang arrives at a Fire Nation village populated by sick and starving people. They are sick because of a nearby Fire Nation munitions factory polluting the river. Katara convinces the group to stay by making Appa appear sick and assumes the role of "The Painted Lady," a local legend, in order to heal the sick and steal food from the factory. eventually destroying the factory, she is forced to give up the ruse to Aang. In response to the destruction of the factory, Fire Nation soliders attack the village, but are repelled by Team Avatar. Katara reveals herself to the villagers, who thank her for her selfless aid. Katara is also thanked by the spirit of the real Painted Lady. Sokka has long felt isolated as the only person of the group unable to bend. Determined to increase his usefulness to the group and the war effort, he seeks out Fire Nation sword master Piandao, still under his assumed Fire Nation identity. With persistence, he convinces the master to take him on as a student. Piandao teaches Sokka the philosophy of swordsmanship by giving him various seemingly boring tasks like painting and rock-gardening. The sword master also helps Sokka forge his own sword, and Sokka chooses to use a meteorite he has found for the necessary material. When Sokka gains Piandao's respect, he becomes ashamed of misrepresenting himself and divulges he is not from the Fire Nation. Piandao reveals that this fact had been readily apparent from their first meeting and that the ways of the sword belong to all nations. He gives Sokka a white lotus Pai Sho tile as a farewell gift. Meanwhile, Iroh, devises a plan to escape his Fire Nation prison and, while feigning the part of a broken and humiliated wretch for his captors, secretly begins an intense training regimen to further build his strength. Note: At the end of the episode, Sokka gives Toph a piece of the meteorite. She bends it to create the Nickelodeon splatter shape. Zuko, Azula, Mai, and Ty Lee are forced to go on vacation to Ember Island. After winning a beach volleyball game, they get invited to a party. Azula tries to flirt but scares guys away with her psychotic raving. Zuko, who has resumed a romantic relationship with Mai, observes a boy flirting with her, and destroys a vase in anger, prompting Mai to tell him off. Later around a campfire, Ty Lee reveals she is so outgoing because she grew up with six identical sisters and hated it. Mai reveals that her parents worried about their careers and gave Mai anything she wanted but required that she always kept her emotions subdued and acted properly, and that this created the cold persona that she feels she must always project to others. Zuko reveals he hates himself because he is not sure of the difference between right and wrong anymore. Azula reveals that she knew her mother thought she was a monster, before brushing it off by claiming that her mother was quite obviously correct. They bond by returning to the party and trashing the place as the host looks on in horror. Meanwhile, Aang and his best friends are attacked by Zuko's assassin, who uses an obscure form of firebending (later referenced as "combustion bending") which channels his power through his third eye to create powerful localized explosions with much more destructive force than normal firebending. Through separate sources, Aang and Zuko both learn about the strong and close childhood friendship of Avatar Roku and Fire-lord Sozin. Sozin suggested to Roku that, as the pinnacle of civilization, the Fire Nation should control the destiny of the entire world to ensure universal prosperity. As Roku was the Avatar, he knew the importance of balance between all people and disagreed. When Sozin later greedily took an Earth Kingdom colony, Roku defeated him in battle and threatened to kill him if he again tried to do anything that crossed that line. When Roku's island volcano erupted years later, Sozin came to help. But, at the last moment, when Roku was overcome by volcanic gases, Sozin realized that he could rule the world if he let Roku die, and he abandoned him. Roku then died from the lava and was reincarnated as Aang. In his prison cell, Iroh tells Zuko that as the great-grandson of both Roku and Sozin, he alone has the ability to resolve their endless conflict and restore order and peace to the world. At the end of the episode, Toph asks if friendships can transcend life times where both Aang and Katara acknowledge and accept Toph's intuition (implying that Aang's next incarnation, Korra, will befriend both Katara and Toph). Katara expresses her disapproval when Toph begins scamming Fire Nation civilians for quick cash. Toph thinks Katara is acting too motherly, and a rift forms within the group. To patch things up, Katara decides to pull a scam with Toph, but they are caught by Zuko's assassin, Combustion Man. He uses them as bait in an attempt to kill Aang, but Katara's quick thinking saves the day. The gang discovers that there have been strange disappearances in a Fire Nation town during a full moon. They befriend an old innkeeper named Hama, who reveals that she is a waterbender from the Southern Water Tribe that had been taken away sixty years previously alongside her fellow Southern waterbenders. She becomes Katara's mentor and shares with her the tragic story of her life as a longtime prisoner of the Fire Nation. A horrified Katara discovers that Hama is enacting her revenge by kidnapping Fire Nation civilians with bloodbending, a sinister and dark technique of waterbending which can only be used by an incredibly strong and skilled waterbender, and only during a full moon when his or her waterbending abilities are at their strongest potential. The resulting battle forces Katara to use the technique against Hama to save Aang and Sokka. Hama is taken away by the village, and she congratulates Katara on mastering bloodbending. A horrified and saddened Katara cries and Aang and Sokka comfort her. The invasion is four days away, and Aang begins to feel nervous about confronting the Fire-Lord. Feeling that he is unprepared, he trains constantly and loses sleep, causing him to hallucinate and have nightmares. After three straight days, it takes the collaboration of Sokka, Toph, and Katara to get him to finally sleep and feel confident about facing Fire Lord Ozai. On the day of the solar eclipse, many allies featured in previous episodes reunite with Team Avatar to a launch the planned invasion of the Fire Nation, lead by Hakoda. Aang finally kisses Katara as sign of his strong feelings for her, worried that he may not return. Relying on several forms of bending and aquatic vehicles designed by Sokka, engineered and constructed by the Machinist, and propelled by waterbending, the invasion forces successfully circumvent several layers of Fire Nation defenses and infiltrate the capital, where they begin a grueling assault towards the palace under constant onslaught from Fire Nation forces. Aang reaches the Fire-Lord's palace, only to find out that no one is present. As the eclipse begins, Sokka, Aang, and Toph search for the Fire-Lord, but only find Azula in an underground bunker, and give chase to her. When Sokka realizes that Azula is merely delaying them to exhaust the time they can benefit from the eclipse, he initially attempts to stop the chase, but Azula provokes him into going on the attack again by telling him of Suki's capture. Zuko confronts his father in another bunker. He tells Ozai that Azula struck down the Avatar, who survived the attack, that the Fire Nation only spreads fear and hatred, and that in order to restore peace he will join forces with the Avatar. Zuko refuses to kill Ozai as that is the Avatar's destiny, not his. As he begins to leave, Ozai stalls him by revealing the events of the night Fire-Lord Azulon died. Azulon had ordered Ozai to kill Zuko, as punishment for Ozai's request to be made heir to the Fire Nation throne, following Iroh's retreat from state affairs after the death of his son Lu-tan at the siege of Ba Sing Se. Desperate to save her son's life, Zuko's mother sought an alternative, creating a treasonous plan for Ozai to take the throne immediately by assassinating Azulon with poison which she would produce; Zuko's mother was banished following the successful implementation of the plan, but Ozai does not reveal where she was sent. As Ozai finishes the tale, the eclipse ends and he attacks. Zuko redirects Ozai's lightning back at him, using the technique taught to him by Iroh and leaves, intent on freeing his uncle. However, Iroh single-handedly breaks out from prison before Zuko can join him. The exhausted and diminished invasion force has no choice but to surrender and be captured, but at the urging of his allies, Aang flees with his friends to the Western Air Temple with Zuko trailing them on a stolen warship balloon. Zuko follows Aang and his friends to the Western Air Temple, seeking to join their group. There, Zuko desperately tries to prove to them that he has changed for the better and wishes only to atone for his past mistakes. It is only after Zuko helps save them from Combustion Man that he receives their acceptance as Aang's firebending teacher and the fifth member of Team Avatar. However, an embittered and cautious Katara still refuses to trust that Zuko has really changed and threatens to take his life at the slightest sign of treachery. Zuko tries to teach Aang how to firebend, but has lost his own ability to bend as he is no longer reliant on rage, the previous focus of his firebending. Toph suggests they learn from the original source of firebending, the mighty dragons. Zuko reveals that his uncle Iroh killed the last dragon long ago, in the last of a line of glory hunts that earns a firebender the title of 'Dragon'., but he also notes that the dragons first imparted their knowledge to the Sun Warriors, a now extinct people who were the genesis of the Fire Nation. Zuko and Aang travel to the ruins of the Sun Warrior civilization, where they discover a tribe of the fabled people still exist. The pair must carry a sacred flame up to the mountain to meet the "Masters", who turn out to be a pair of surviving dragons, but their flames go out at the last moment. They perform the dragon dance, a series of firebending forms seen carved in the ruins, and the last two dragons reveal that at its core firebending is a source of life, not destruction. The Sun Warriors reveal that Iroh had lied about the extinction of the dragons after receiving similar training, in order to protect the remaining members of the species from further hunts. Both Aang and Zuko begin to firebend again, stronger and more skillfully than before. Sokka and Zuko infiltrate the Fire Nation's top prison, the Boiling Rock, to find Sokka's father Hakoda. It is surrounded by a boiling lake, trapping Sokka and Zuko when their balloon crashes. They find Suki and hatch an escape plan with Sokka disguised as a guard. Zuko is captured and the warden, Mai's uncle, recognizes him. A prisoner, Chit Sang, blackmails them into letting him join help orchestrate the escape. As they are nearing escape, a new batch of prisoners arrive, including Sokka's father Hakoda. Sokka, Zuko, and Suki decide to stay to save him. Chit Sang and his friends leave without them but make a mistake. Sokka, Zuko, Suki, and Chit Sang create a new plan for escaping the prison after the original plan failed. Mai appears and demands to know why Zuko left her. He says he's trying to save the Fire Nation, not destroy it. Later, Sokka and allies take the warden hostage to escape on the gondola which provides access to the prison over the boiling water. The guards attempt to cut the line following the warden's orders, but Mai saves them by stopping the guards. Azula is furious over her betrayal, but Mai declares she loves Zuko more than she fears Azula, enraging Azula further. After Ty Lee stops Azula's attack on Mai with Chi-blocking (a technique which allows her to temporarily eliminate the abilities of a bender) and tries to aid her escape, Azula furiously has them both imprisoned. Azula chases Aang from the temple. Zuko confronts Katara about her distrust of him and tries to gain her friendship. He decides to help Katara find the soldier responsible for Kya's untimely death. Aang warns her that revenge is not the answer. Along the way, Katara's behavior becomes increasingly aggressive, and she even resorts to mercilessly bloodbending a Fire Nation soldier. They eventually find the retired soldier, Yan Rha, who reveals that Katara's mother had died protecting her. Despite Katara's rage, pain, and desire for revenge, she is unable to take Yam Rha's life as revenge. Katara and Zuko leave, and once reunited with a relieved Aang and the rest of Team Avatar, Katara finally forgives Zuko and accepts his friendship. Sokka discovers that the Ember Island Players, a Fire Nation theater group, is debuting a play based upon their adventures. The play turns out to be Fire Nation propaganda, and although the audience enjoys the play, Aang and his friends are embarrassed by the inaccurate and exaggerated portrayals of themselves (with the sole exception of Toph, who is amused by her depiction as a large muscled man who employs a primitive form of sonar by yelling at everything). In context, the play also serves as a concise summary of Aang's entire journey throughout the show. The play ends with the Fire Nation winning the war, Azula killing Zuko and the Fire Lord killing the Avatar, which triggers a standing ovation from the audience and clearly frightens Aang. Aang has decided to fight the Fire-lord after Sozin's Comet passes. Zuko derails this plan by revealing that Ozai intends to raze the entire Earth-Kingdom continent while under its influence. The gang begins a frantic training regimen while Aang struggles with his responsibilities: his friends exhort him to simply kill Ozai, but Aang clings to the pacifist beliefs of his Air-Nomad heritage. In his sleep, Aang is drawn towards a mysterious island that appears suddenly in the sea; the next day, his friends find June the Bounty Hunter to attempt to locate him again. Ozai bequeaths the Fire Nation throne to Azula and declares himself "Phoenix King", ruler of the known world, while Aang awakens on the unknown island now in the middle of the sea. 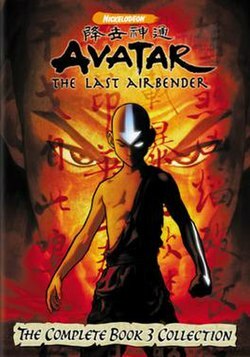 On the island, Aang seeks guidance from his past lives, but they too insist he may have to take violent action against the Fire Lord. The island turns out to be a giant lion-turtle, which gives Aang the guidance he has been seeking. After June is unable to find Aang, Zuko decides to ask June to find his uncle Iroh instead. After June leads them to the outer wall of Ba Sing Se, they meet King Bumi, Jeong Jeong, Master Pakku, and Master Piandao, who are revealed to be members of the Order of the White Lotus, a secret society, presently lead by Iroh, that is constituted by citizens of all three surviving nations. After reuniting with Iroh, the team decides to split up and go in different directions to help stall the Fire Nation's plans: Zuko and Katara will handle Azula at the capital of the Fire Nation; Sokka, Suki and Toph will attempt to deflect the Fire Nation airships encroaching on the Earth Kingdom, and Iroh is to lead the White Lotus in the liberation of Ba Sing Se. Sozin's Comet arrives and Phoenix King Ozai prepares to destroy both the Earth Kingdom and the Avatar. Azula's mental stability, undermined by the betrayal of her childhood friends at the Boiling Rock, begins to deteriorate as her coronation as Fire Lord approaches. Zuko and Katara confront her right when she is about to be crowned, but Azula challenges her brother to an Agni Kai. Zuko, although initially prevailing against his sister's unbalanced assault, is gravely injured when he dives in front of lightning that Azula throws at Katara. Aang duels Ozai, but still being unwilling to kill, is kept constantly on the defensive, narrowly avoiding Ozai's onslaught of firebending, which is powerfully augmented by Sozin's Comet. Sokka, Toph, and Suki attempt to halt the Airship fleet but are soon separated, while the Order of the White Lotus battles for Ba Sing Se's freedom. With a chance injury, Ozai accidentally causes Aang to enter the mighty Avatar State. The Order of the White Lotus successfully liberates Ba Sing Se, while Sokka, Suki and Toph successfully disable all of the airships in the Fire Nation attack armada. Katara fights and outmaneuvers Azula, freezing her in ice and then chaining her to the ground, triggering a psychotic breakdown in Azula. Katara then uses her exceptionally strong healing abilities to revive a severely wounded Zuko. Aang, in the power of the Avatar state, chases and easily overwhelms Ozai, yet still refuses to kill him. Aang uses knowledge he received from the lion-turtle and employs an ancient form of bending to alter the natural energy within Ozai, using the technique to permanently strip him of his firebending abilities, defeating the Phoenix King without taking his life. In an epilogue sequence set some days later, newly appointed Fire Lord Zuko declares the war over. Zuko and Mai reconcile officially, and Zuko confronts his father, angrily asking where his mother, Ursa, is being kept. Some time later, "Team Avatar" celebrate together at Iroh's tea shop in Ba Sing Se; slipping out to share a quiet moment together, Aang and Katara embrace and kiss under the sunset. The series is directly followed by The Promise, The Search, The Rift, Smoke and Shadow, North and South and Imbalance comic trilogies.It is followed by The Legend of Korra, taking place seven whole decades later. The first three DVD volumes contain five episodes each, and the fourth volume contains six. A later boxed set contained all four volumes. The first DVD was released on October 30, 2007, and the complete boxed set was released on September 16, 2008. They are released by Paramount Home Entertainment. Each of the individual Season Three DVDs also comes complete with an exclusive comic book. The Complete Book 3 Collection DVD includes the following DVD extras: Inside Sozin's Comet: Exclusive Four-Part Commentary by Creators, The Women of Avatar: The Last Airbender, Book 3 Finale Pencil Test Animation and Into the Fire Nation at San Diego Comic-Con. The boxed set was released on February 1, 2010 in the United Kingdom. 1.^ Production code format taken from the commentary for "Sozin's Comet Part 1: The Phoenix King"
"Season 3". Avatar: The Last Airbender. IGN. Retrieved July 21, 2008. "Season Three DVD Information - TVShowsOnDVD.com". TVShowsOnDVD.com. Archived from the original on 9 October 2008. Retrieved October 28, 2008. ^ Luening, Erich (September 7, 1999). "CBS, Viacom in blockbuster merger — CNET News". CNET. Archived from the original on October 24, 2012. Retrieved December 27, 2008. ^ DiMartino, Michael Dante; Konietzko, Bryan (August 29, 2005). "Interview with "Avatar" Program Creators — Page 3". Animation Insider (Interview: Transcript). Interviewed by Aaron H. Bynum. Archived from the original on August 4, 2008. Retrieved May 29, 2008. ^ a b c d "Avatar: The Last Airbender Cast and Details". TVGuide.com. Archived from the original on 16 December 2008. Retrieved November 26, 2008. ^ DiMartino, Michael Dante; Konietzko, Bryan (August 29, 2005). "Interview with "Avatar" Program Creators — Page 4". Animation Insider (Interview: Transcript). Interviewed by Aaron H. Bynum. Archived from the original on May 27, 2011. Retrieved May 29, 2008. ^ Harris, Jeffery (February 4, 2008). "Avatar: The Last Airbender - Book 3: Fire / Volume 2 Review:". IGN. Archived from the original on October 6, 2008. Retrieved March 17, 2009. ^ Rich, Jamie S. (January 22, 2008). "Avatar The Last Airbender — Book 3: Fire, Vol. 2". DVDTalk.com. Archived from the original on December 16, 2008. Retrieved July 21, 2008. ^ Rich, Jamie S. (May 6, 2008). "Avatar the Last Airbender — Book 3: Fire, Vol. 3". DVDTalk.com. Archived from the original on December 25, 2012. Retrieved July 21, 2008. ^ "'Avatar' Officially Over, but Perhaps Not Quite So". BuddyTV. July 22, 2008. Archived from the original on 7 December 2008. Retrieved December 27, 2008. ^ "Avatar The Last Airbender Book 3 Fire, Vol. 1 : DVD Talk Review of the DVD Video". Dvdtalk.com. Archived from the original on 16 December 2008. Retrieved November 22, 2008. ^ "2008 Annie Awards: For Your Consideration". Annie Awards. Archived from the original on 2 December 2008. Retrieved December 2, 2008. ^ "Annecy 2008 - Official Selection". Annecy 2008. 2008. Archived from the original on March 21, 2017. Retrieved May 7, 2008. ^ "56th Golden Reel Awards Television Nominees - Best Sound Editing in a TV Animation". Motion Picture Sound Editors. 2009. Archived from the original (PDF) on March 18, 2009. Retrieved January 31, 2009. ^ a b "Top Cable Nov 26-Dec 2, NFL & Tin Man". TVByTheNumbers. Archived from the original on November 3, 2012. Retrieved 2012-11-04. ^ a b c d e f g h "Nielsen Ratings Cable TV Top 20: Home Run Hit for ESPN 07/22/2008". TVByTheNumbers. Archived from the original on September 13, 2012. Retrieved 2012-11-04. ^ "Avatar: The Last Airbender Search". Amazon.com, Inc. Retrieved June 5, 2008. ^ Harris, Jeff. "IGN: Avatar: The Last Airbender — Book 3: Fire May 27, 2008". Archived from the original on October 3, 2008. Retrieved December 27, 2008. ^ "DVD Empire — Item — Avatar: The Last Airbender — The Complete Book 3 DVD Box Set / DVD-Video". DvdEmpire. Archived from the original on 16 January 2009. Retrieved December 27, 2008. ^ a b "Avatar: The Last Airbender Season 3". Play.com. Archived from the original on November 18, 2009. Retrieved January 30, 2010. ^ "Avatar - The Legend of Aang: Book 3 - Fire: Volume 1". EzyDVD. Archived from the original on 10 April 2010. Retrieved April 28, 2010. ^ "Avatar - The Legend of Aang: Book 3 - Fire: Volume 2". EzyDVD. Archived from the original on September 23, 2010. Retrieved July 7, 2010. ^ "Avatar - The Legend of Aang: Book 3 - Fire: Volume 3". EzyDVD. Archived from the original on 6 August 2010. Retrieved August 4, 2010. ^ a b "Avatar: The Last Airbender Season Three DVD Information". TVShowsOnDVD.com. Archived from the original on 9 October 2008. Retrieved October 28, 2008.